Judah b. Eliezer ha-Levi Minz (Minzi), the progenitor of the most prominent branch of the family, settled, or was born, in Italy in the fifteenth century. 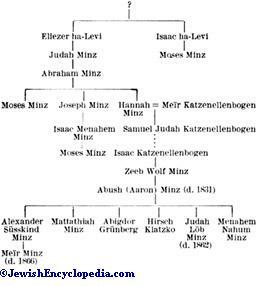 His cousin Moses b. Isaac ha-Levi Minz (Minzi) was a rabbi in Germany. 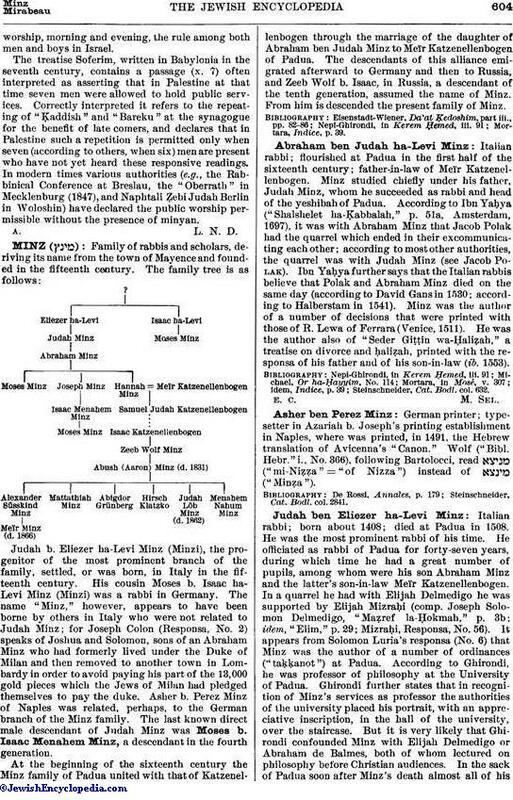 The name "Minz," however, appears to have been borne by others in Italy who were not related to Judah Minz; for Joseph Colon (Responsa, No. 2) speaks of Joshua and Solomon, sons of an Abraham Minz who had formerly lived under the Duke of Milan and then removed to another town in Lombardy in order to avoid paying his part of the 13,000 gold pieces which the Jews of Milan had pledged themselves to pay the duke. Asher b. Perez Minz of Naples was related, perhaps, to the German branch of the Minz family. 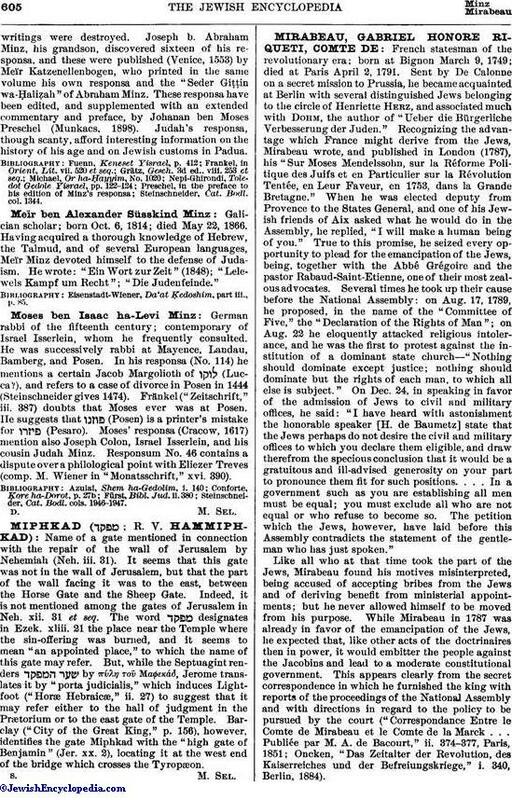 The last known direct male descendant of Judah Minz was Moses b. Isaac Menahem Minz, a descendant in the fourth generation. At the beginning of the sixteenth century the Minz family of Padua united with that of Katzenellenbogen through the marriage of the daughter of Abraham ben Judah Minz to Meïr Katzenellenbogen of Padua. The descendants of this alliance emigrated afterward to Germany and then to Russia, and Zeeb Wolf b. Isaac, in Russia, a descendant of the tenth generation, assumed the name of Minz. From him is descended the present family of Minz. Italian rabbi; flourished at Padua in the first half of the sixteenth century; father-in-law of Meïr Katzenellenbogen. Minz studied chiefly under his father, Judah Minz, whom he succeeded as rabbi and head of the yeshibah of Padua. According to Ibn Yaḥya ("Shalshelet ha-Ḳabbalah," p. 51a, Amsterdam, 1697), it was with Abraham Minz that Jacob Polak had the quarrel which ended in their excommunicating each other; according to most other authorities, the quarrel was with Judah Minz (see Jacob Polak). Ibn Yaḥya further says that the Italian rabbis believe that Polak and Abraham Minz died on the same day (according to David Gans in 1530; according to Halberstam in 1541). Minz was the author of a number of decisions that were printed with those of R. Lewa of Ferrara (Venice, 1511). He was the author also of "Seder Giṭṭin wa-Ḥaliẓah," a treatise on divorce and ḥaliẓah, printed with the responsa of his father and of his son-in-law (ib. 1553). Steinschneider, Cat. Bodl. col. 632. German printer: type-setter in Azariah b. Joseph's printing establishment in Naples, where was printed, in 1491, the Hebrew translation of Avicenna's "Canon." Wolf ("Bibl. Hebr." i., No. 366), following Bartolocci, read ("mi-Niẓẓa"= "of Nizza") instead of ("Minẓa"). Steinschneider, Cat. Bodl. col. 2841. Italian rabbi; born about 1408; died at Padua in 1508. He was the most prominent rabbi of his time. He officiated as rabbi of Padua for forty-seven years, during which time he had a great number of pupils, among whom were his son Abraham Minz and the latter's son-in-law Meïr Katzenellenbogen. In a quarrel he had with Elijah Delmedigo he was supported by Elijah Mizraḥi (comp. Joseph Solomon Delmedigo, "Maẓref la-Ḥokmah," p. 3b; idem, "Elim," p. 29; Mizraḥi, Responsa, No. 56). It appears from Solomon Luria's responsa (No. 6) that Minz was the author of a number of ordinances ("taḳḳanot") at Padua. According to Ghirondi, he was professor of philosophy at the University of Padua. Ghirondi further states that in recognition of Minz's services as professor the authorities of the university placed his portrait, with an appreciative inscription, in the hall of the university, over the staircase. But it is very likely that Ghirondi confounded Minz with Elijah Delmedigo or Abraham de Balmes, both of whom lectured on philosophy before Christian audiences. In the sack of Padua soon after Minz's death almost all of hiswritings were destroyed. Joseph b. Abraham Minz, his grandson, discovered sixteen of his responsa, and these were published (Venice, 1553) by Meïr Katzenellenbogen, who printed in the same volume his own responsa and the "Seder Giṭṭin wa-Ḥaliẓah" of Abraham Minz. These responsa have been edited, and supplemented with an extended commentary and preface, by Johanan ben Moses Preschel (Munkacs, 1898). Judah's responsa, though scanty, afford interesting information on the history of his age and on Jewish customs in Padua. Steinschneider, Cat. Bodl. col. 1344. Galician scholar; born Oct. 6, 1814; died May 22, 1866. Having acquired a thorough knowledge of Hebrew, the Talmud, and of several European languages, Meïr Minz devoted himself to the defense of Judaism. He wrote: "Ein Wort zur Zeit" (1848); "Lelewels Kampf um Recht"; "Die Judenfeinde." Eisenstadt-Wiener, Da'at Ḳedoshim, part iii., p. 85. German rabbi of the fifteenth century; contemporary of Israel Isserlein, whom he frequently consulted. He was successively rabbi at Mayence, Landau, Bamberg, and Posen. In his responsa (No. 114) he mentions a certain Jacob Margolioth of (Lucca? ), and refers to a case of divorce in Posen in 1444 (Steinschneider gives 1474). Fränkel ("Zeitschrift," iii. 387) doubts that Moses ever was at Posen. He suggests that (Posen) is a printer's mistake for (Pesaro). Moses' responsa (Cracow, 1617) mention also Joseph Colon, Israel Isserlein, and his cousin Judah Minz. Responsum No. 46 contains a dispute over a philological point with Eliezer Treves (comp. M. Wiener in "Monatsschrift," xvi. 390). Steinschneider, Cat. Bodl. cols. 1946-1947.